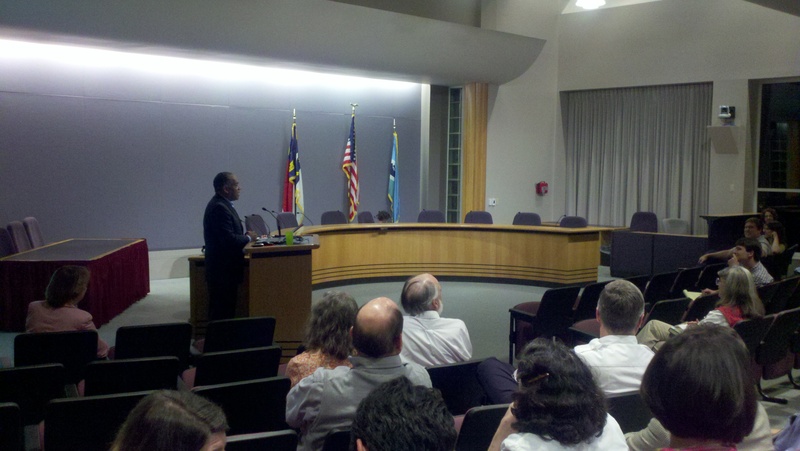 On November 22 at 5:30 PM more than 50 people gathered at Chapel Hill Town Council Chambers to listen to American Planning Association President Mitchell Silver discuss the demographic trends revealed by the 2010 census and what they mean for the Chapel Hill 2020 planning process. Mr. Silver’s presentation was wide ranging and humorous, driving home his points about changes in our demographic make-up and their implications for growth, change and evaluating our community’s vision and values. He emphaiszed the need to focus on open, honest conversations throughout the process and to begin focusing on the values and trade-offs of our decisions. Mr. Silver’s presentation was based on his analysis of demographic trends and our changing community patterns. Silver’s analysis served to indicate trends that might inform some of the discussions for Chapel Hill 2020, though the trends’ impacts may not be fully felt until 2030, 2040, or 2050. Mr. Silver began his talk by discussing the planning profession and the transition of its role from process back to planning. He discussed plans as policy documents that set the vision and values and then codes codify those visions and values to protects the public interest, safety, and welfare. The primary demographic trend Silver discussed for North Carolina is an increase in population that has taken North Carolina from the 12th most populous state to the 10th most populous state, and will see North Carolina be the 7th most populous state by 2030. Other trends that will impact the needs of the built environment and communities include the aging of the population, where one in five people will be over the age of 65 by 2050, the changing make up of households, where the number of single households will equal the number of family households by 2025, and the diversifying of the population such that by 2042 there will be no majority race. On top of these trends, our communities are also facing the interactions of multi-generational households as boomerang kids and aging parents are moving in with the generation in the middle. Mr. Silver discussed the ways these trends impacted Raleigh’s thinking about its 2030 comprehensive plan which ultimately had consequences for the zoning code in being more creative in planning new types of development. For the process of planning, Mr. Silver stressed the importance of having difficult conversations and incorporating the voices of all generations, and realizing that outreach to different generations will require different media of communications. The most important attribute of the process is open and honest conversation about visions and values for the town. The next theme group meeting will be held December 1 from 4:30 to 6:30 at Frank Porter Graham Elementary School. The core message from Mr. Silver’s presentation for planners is that the times they are a changing as are the baby boomers transition out of leadership roles and hand off to the Gen Xers and the Y and the Zs that follow. The emerging socio-economic map of the US is tilting towards urban living, fewer single households, smaller homes and a demographic shift that will have significant impact on the labor market in a competitive global arena where education is key. Planners need to think globally and act locally. What are the total population figures for Chapel Hill at the end of every decade since 1950 as well as forecasts for the total population of Chapel Hill for the coming decades ending in 2050? What bio-capacity or biomass lies within Chapel Hill’s borders and what needs to be protected in order to preserve an acceptable quality of life for the townspeople? Looking at each decade between 1950 and 2050, what has been the average number of children per family in Chapel Hill through 2010 and what are the projections for the coming four decades? What health education programs and family planning facilities are present in Chapel Hill, how effective are they and what more needs to be done between now and 2020? Can a plan be developed and implemented for raising awareness and educating the citizens of Chapel Hill about population realities, both locally and globally? Many thanks to Mitch Silver, the inspiration of Jonathan Howes, the friendship of Rosemary Waldorf and residents of Chapel Hill. An email this morning from info@chapelhill said the talk would be available here http://chapelhill.granicus.com/ViewPublisher.php?view_id=9, but I don’t find it. Will it be available? I think this is “boot camp” material that all participants should have access to. We need to work out some permissions but we do plan to have the materials available shortly in one form or another. Glad you found it useful!